As global demand for solar power as an alternative energy option rises, it will be to the advantage of solar photovoltaic (PV) panel manufacturers and installers to ensure superior product quality while using cost-effective, reliable materials in assembly. Both rooftop and foundation-mounted solar PV panel products can be enhanced by durable, long-lasting framing materials, which can be configured, cut, and assembled on or offsite to suit very complex geometrical shapes and a wide range of installation needs. Cold formed steel (CFS), also known as Light Gauge Steel (LGS), meets that standard. It is optimal for solar racking and mounting, and is highly customisable to suit any project anywhere, even in remote areas. CFS is light, easy to assemble, and does not require specific heavy lifting equipment, such as cranes, in order to be erected. Even when unique roof designs, foundations, or terrain present new challenges, properly-fitting CFS solar racking can be made to achieve the desired results. In this blog, we look at the suitability of CFS when building for the technical requirements of solar panel projects. The highly adaptable nature of cold formed steel allows it to be engineered and designed for all types of terrain, slopes and weather conditions. CFS framing designed and engineered with FRAMECAD Software can be made resistant to high winds and specific loads. Given these qualities, CFS components using the FRAMECAD System offer a key competitive advantage for solar panel manufacturers and retailers. For more examples of the versatility of CFS see our ebook, ‘The endless possibilities of Cold Formed Steel applications’ for many more ideas and use cases across industries. The strength of Cold Formed Steel — which is often used to construct framing structure for entire buildings, but versatile enough to make rapidly small components for precise manufacturing applications — helps create very long-lasting, easily maintained solar panel mounting systems. While offering high rigidity due to high tensile strength, Cold Formed Steel components manufactured by the FRAMECAD equipment are light, highly accurate and easy to assemble. The panel mounting systems can be manufactured and assembled in a factory-controlled environment prior to be transported onsite or alternatively a mobile factory can be brought to site, enabling components to be made during the installation phase. Because CFS fabrication machines can be brought onsite, adjustments to components can be made on location. For remote solar panel installations, especially those that call for mounting to unusual roofing or terrain, the ability to fabricate CFS framing parts on demand is a major advantage. Light, yet durable Cold Formed Steel offers flexibility in thickness, design and custom lengths, which makes it an excellent alternative to aluminium or hot rolled steel. 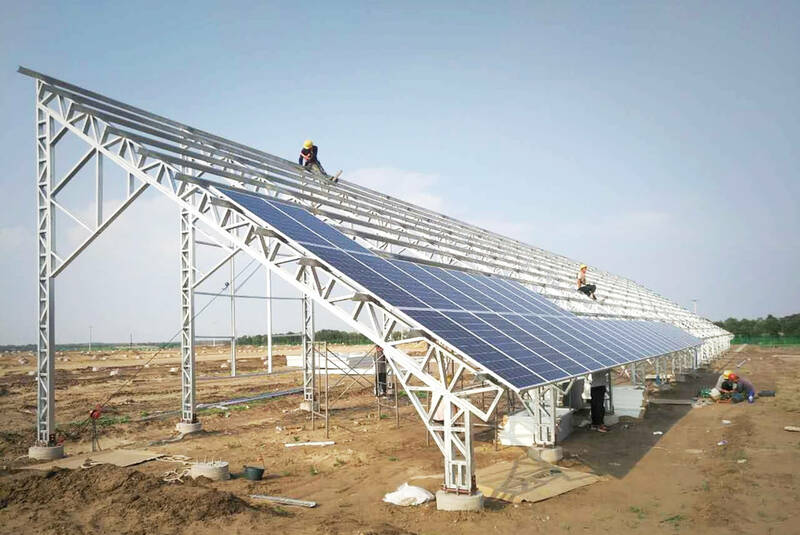 It is a fast and cost-effective solution when a sturdy, dense support structure for solar modules is the priority. Cold formed steel components can be precisely designed and engineered within the FRAMECAD Structure software and built to specification to satisfy local building codes and a vast range of solar panel framing projects. The accuracy and light-weight nature of Cold Formed Steel framing ensure fast manufacturing, rapid assembly, and erection on any site — even remote locations. Cold Formed Steel is also resistant to damage from rust. The FRAMECAD system commonly uses hot dipped galvanized coil protected by a layer of zinc to provide corrosion resistance. Whether PV or thermal solar panels are mounted to a rooftop, remote-mounted, or attached to a large device, CFS racking and mounting resists high winds and rust. End customers can rest assured that solar panels will not be uprooted by damaging winds, or that the solar mounting structure will not be generally weakened by inclement weather. For manufacturers, using CFS to make the mounting can help justify extended solar product warranties. For solar energy applications, prefabrication of CFS framing allows for faster controlled production and assembly of products and eliminates delays in installation. Prefabricated Light Gauge Steel components can come ready to use as pre-assembled modules or can be assembled onsite. On-line cutting, drilling service holes for wiring, and custom punching all help to serve the technical needs of a solar energy setup. All in all, prefabricated CFS structural components for solar panel framing help create a high-quality and accurate final product. Onsite CFS additions can also give solar panel installers greater control over timelines, when setup calls for late-stage adjustments and unique parts. For residential and commercial end users, and for ground installations and rooftop anchor systems, cold formed steel is a durable, cost- effective choice for solar array framing. In fact, it is just one of many possible CFS applications in construction and manufacturing, as industries across the globe are rapidly discovering. The FRAMECAD system streamlines the design, manufacturing and assembly process to help our clients achieve project goals on time, or ahead of schedule. A number of FRAMECAD’s valued solar energy clients have found CFS framing to be ideal for solar arrays. Cold Formed Steel is very strong, can adapt to arrays of various sizes and can be configured for tilting panels to any standard slope, to be mounted on any surface.